I don't think I've ever shown you a photo of our complete dining area. This is the aerial view from the staircase...so much light floods our home during sunny days that it is difficult to take photos that are not completely blown out...or blue. The acid-washed concrete floors lend a bluish tone to the photos sometimes. My plan is to purchase a rug to go under the table after the first of the year...but that is a totally different nightmare for a later discussion. I did make some changes from the inspiration photo. Instead of chargers, I used bread boards I found on clearance at Pier 1. I like the contrast of the darker wood against the white plates. I also added more layers to the plate arrangement. The "Merry and Bright" plates are some that I found at Hobby Lobby a few years ago. I had the gold silverware...that sounds weird doesn't it...gold silverware. It doesn't just roll off the tongue. The blingy napkin holders were found at Pier 1 as well. When I saw them they jumped into my hands...literally. I knew they would be perfect with the other gold elements on the table. The centerpiece lantern and greenery stayed in place, as did my burlap-looking runner. I removed the yellow pod-looking stems and replaced them with stems of gold ornaments that I found at Hobby Lobby. I also added the berry stems...found at Hobby Lobby. I sound like a tape recorder...Pier 1, Pier 1, Hobby Lobby, Hobby Lobby, Hobby Lobby! The stemware came from HomeGoods a few years ago. I hand wash these glasses so the writing doesn't fade away. I really like using touches of gold and silver around the holidays. I like the reflectiveness of the pieces and all the "sparkle" that it adds to our home. 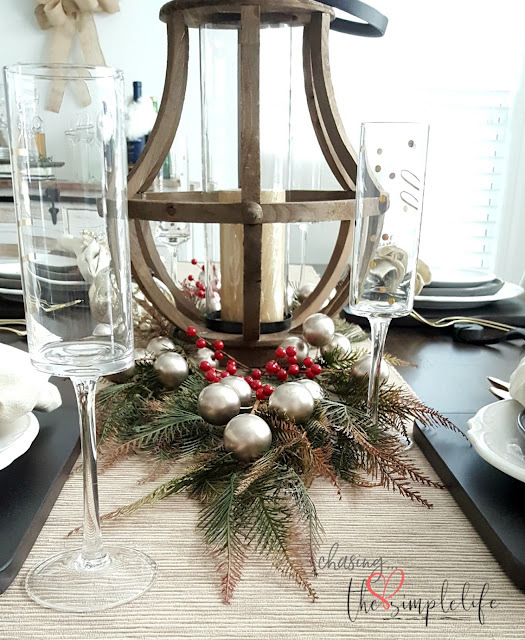 I also like mixing the more elegant pieces with the rustic pieces...for a different holiday touch. 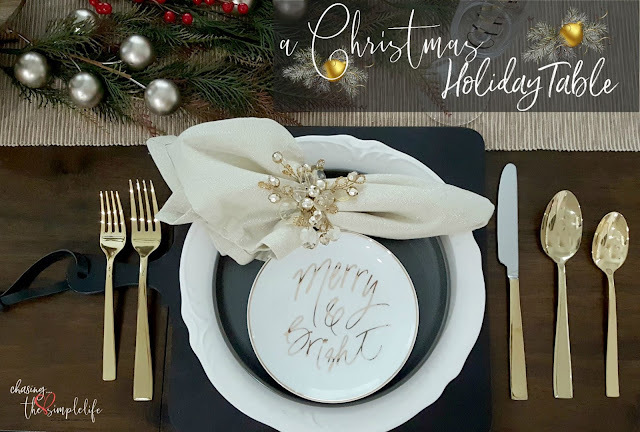 Now you've seen how I decorate our table for the Christmas holiday, tell me...how do you like to decorate your Christmas table? I love your table in it's simplicity. Those plates and stemware are fabulous! I am all about the red plaid tablecloth, Christmas dishes, red napkins and gold rimmed stemware. Of course I use vintage items for down the middle to decorate. I AM trying to simplify everything but it is hard for a color-loving, everything-out-and-around-me- kinda person. Thanks for the inspiration! Thank you so much! I didn’t want a lot on the table and wanted to keep it simple. I love the traditional colors also, but our house is so muted, I don’t know how they will look. I may throw some red into the mix for Valentine’s Day. Thank you again! Love and hugs! How pretty! This year I am going for a rustic elegant look with rumpled linen and red roses. Thank you so much! I can't wait to see it! I bet it will be beautiful! Love and hugs! That's an elegantly handsome table, and I know that sounds just about as weird as gold silverware, but it's how I see it. I love it. Btw, love that flatware. I have those same napkin rings in silvertone and wasn't sure where they came from, thank you. My tables are each different simply because my rooms are different. Sunroom - woodland, DR - more elegant, Breakfast table - somewhere in between. I will likely be mixing and not matching any tableware this Christmas Eve, as my family guest list has grown to 38 now (agghhh!). I am my own caterer, and I think I need to retire after this one. Big families (and growing every year) = big bashes. Doesn’t sound weird at all! And thank you very much! I change up our table often and sometimes it will be very casual, sometimes rustic, sometimes elegant…just depends. I like mixing…makes tables more interesting. WOW, that is awesome!! Our family members are so spread out I don’t know if we could ever get them all together! Thank you again Rita! Love and hugs! Benita, what a fabulous photographic shot your second photo is! You should include one of those with every new table. And even though I know I'll love a rug when you add it, right now that floor is an amazing background for this picture. I agree, Christmas tables deserve some bling and yours is beautifully done. I have only vague ideas yet about how to do my Christmas table. Right now there are only 4 smallish Christmas trees on it with an old little china horse that is beginning to lose its tail, sounds weird but it was a happy accident that I love. Later on I'll put out my Spode Christmas tree plates with luncheon size cranberry rimmed Spode plates on top that I don't know the pattern of. But for our biggest family party where about 24 will be here in this small house we're not doing a sit down dinner but instead will have afternoon finger foods that people can eat while moving around, everyone contributing either appetizers or desserts. Now that I'm a great-grandmother it's time to ask for plenty of help, don't you think? 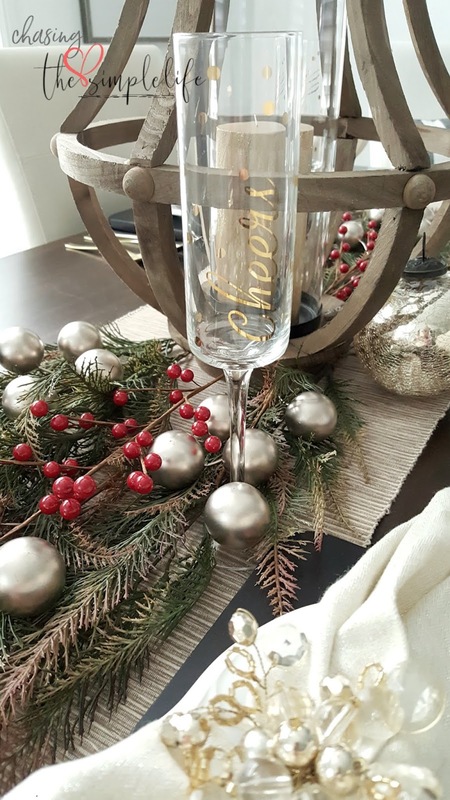 Benita, you definitely brought the bling to your pretty table and I love it. Thank you for the view from the stairs, it makes an outstanding photo. I also love all the elements your chose, the bread boards are perfect as well as the gold silverware and napkin rings. Your table is stunning! Hugs dear friend. Kari, thank you so much!! I like mixing it up for the table. I don't have any fine china to use...no one in our family had any to pass down and I could never settle on a pattern I really liked, so I normally stick with plain white or off-white dishes that will go with anything. The napkin rings and gold flatware balance out those bread boards, which I just fell in love with. I hate that they only had 4 and had no others available online...but it works for us for the holidays. Thank you again so much! Love and hugs to you sweet friend! Oh just love. Those napkin rings from Pier 1 are gorgeous. I love the gold and white together. Really beautiful. You knocked it out of the park on this one. You go girl with your savvy self. Looks so pretty. Thank you so much Kris! 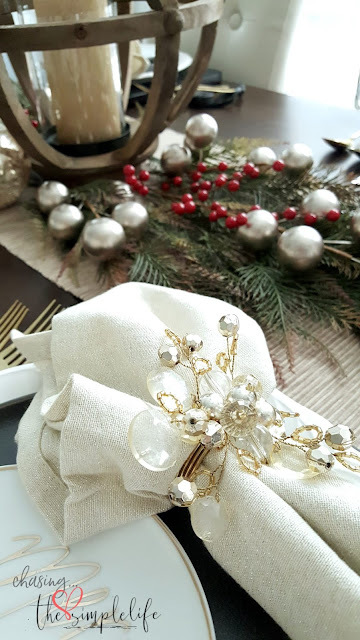 I fell in love with those napkin rings when I saw them and they were on sale…so it was a win/win all the way around…LOL. Thank you again so much! Hope your week is off to a great start! Love and hugs to you! The bread boards were a great find! The table is beautiful. Thank you so much Brenda! I saw those bread boards and knew I had to use them somewhere on the Christmas table! Love and hugs to you! Ok don't yell at me.....you won't believe it but for Christmas dinner we actually use (gasp!) red clear plastic disposable plates!!!! My sister started buying them a few years ago since there are SOOOOO many of us for dinner and she would end up stuck at the sink for ages, even with a dishwasher. And you know what? That's ok, it's who's around the table that counts! They look fine....I still use a nice tablecloth, centerpiece, candles, stemware, linen napkins.....and plastic disposable plates ha ha!! Your table looks wonderful! I'm having a small dinner party next week, that table will be more 'decorated' than my Christmas table! Honey, there are so many beautiful designs for the plastic plates and serving ware…I think it is wonderful and I take advantage of it when we have guests! You are exactly right…it is definitely WHO is around the table that counts and no one wants to spend time cleaning up when they could be spending time with family! No one ever comes to Texas for the holidays…we always go to Alabama, so our table doesn’t get used for Christmas…I can decorate it and let it sit….LOL. 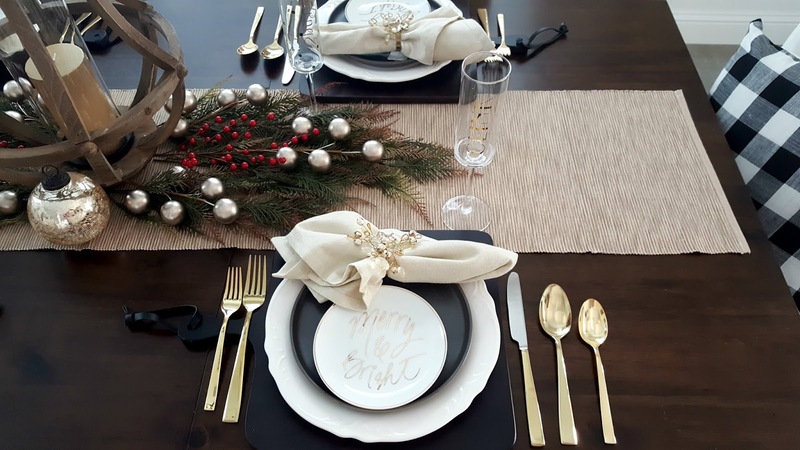 On the years we do have a friend/neighbor/employee holiday gathering, I use plastic plates and disposable gold flatware and spread everything out on the island. It’s casual and people can visit and I don’t have to wash tons of dishes afterwards. It all goes in the trash!! 😊 Love and hugs to you! Your table is so pretty and elegant! I especially like the centerpiece. I don’t do our Christmas table the same each year, but I almost always use my red transferware. Melissa, thank you so much! I don't do ours the same either, every year is different for Thanksgiving and Christmas. I'm all about what is easy to change! I bet the transferware is beautiful and cannot wait to see photos! Hugs! Thank you so much! I change ours every year and never know until I see something that inspires me as to what it is going to be! Can't wait to see your when you pull it together! :-) Love and hugs! 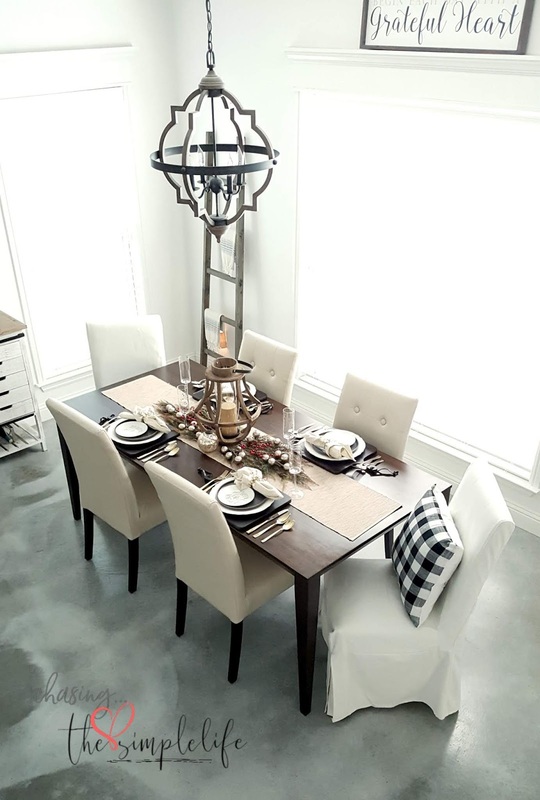 Your table is gorgeous and glamorous and elegant and festive, Benita...and your dining area itself is a dream. You have such a great eye. I always love getting a chance to peek into your pretty home. I haven't really thought about my Christmas table. I may use my mom's long lost china or my Christmas Tree Spode or my plain white Pottery Barn dishes. We've already had a big celebration with some friends and we had to do a buffet...no table settings. Boo. Enjoy the weekend!! Thank you so much Kim, I appreciate your sweet comments! Unfortunately, there is no china here…I never could pick out a pattern when I got married, my mother never had any and my sweet MIL still uses all of hers. I stick with white or off-white because I can put anything with it to make it work. I love the Christmas Spode china, it is gorgeous and is something that can be dressed up or dressed down. Hope you had a great weekend! Love and hugs! I love your elegant blinged blinged table, Benita, and quite envy the amount of natural light you have in the room. Happy December to you and your family. Thank you so much Amalia! This house is flooded with light...well, all of downstairs is flooded...upstairs, not so much. A much darker vibe hangs upstairs. :-) Happy holidays to you and your family also! Love and hugs! What an elegant table. I love the napkin rings! May you have a wonderfully blessed holiday season. Thank you so much Laura! I hope you and your family have a blessed holiday as well! Merry Christmas! Your table is so lovely, Benita. Love the 'Merry and Bright' plates. You know, Pier 1 is my favorite shop. The napkin ring holders are pretty and add a special touch. I usually have red and silver and Christmas, but last year I saw my best friend's red and gold décor, and it was stunning. I see you have gold accents as well. You have a flare for decorating, and everything looks so nice. Merry Christmas to you, Benita, and I look forward to seeing more of your wonderful posts in the new year. Sheri, thank you so much! Pier 1 is such a great store and I enjoy shopping there when they have their great sales...which have been fabulous lately! I have fallen in love with having gold touches all through the house, especially on our table. It really helps break up all of the black/white/gray colors. Thank you again and I hope you and your family have a wonderfully blessed Christmas and New Year! Hugs!